This RECREATED EXPEDITION RIFLE has been crafted based on the careful study of the five presently-known surviving examples (two of which are signed by Jacob Dickert) of the U.S. "Publick" Rifles in stores at Harpers Perry when Meriwether Lewis arrived in 1803. All stock measurements and barrel profiles were derived from these five extant specimens. 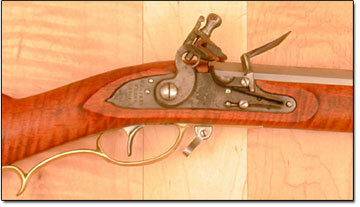 Buttplate and triggerguard castings were taken from rifles by Jacob Dickert and Peter Gonter, both suppliers of U.S. contract rifles in 1792 and 1794.